Sadly, the RANGE window frame extent does not currently allow an interval in SQL Server. While not horribly inefficient, it seems like it should be possible to express this query using only window aggregate and analytic functions supported in SQL Server 2012, 2014, or 2016 (so far). For clarity, I am looking for a solution that performs a single pass over the data. In T-SQL this is likely to mean that the OVER clause will do the work, and the execution plan will feature Window Spools and Window Aggregates. All language elements that use the OVER clause are fair game. A SQLCLR solution is acceptable, provided it is guaranteed to produce correct results. Ideally, solutions will produce exactly the same results in the same order as the subquery version above, but anything arguably correct is also acceptable. Performance is always a consideration, so solutions should be at least reasonably efficient. Dedicated chat room: I have created a public chat room for discussions related to this question and its answers. Any user with at least 20 reputation points can take part directly. Please ping me in a comment below if you have less than 20 rep and would like to take part. Discussion for "Date range rolling sum using window functions"
Great question, Paul! I used a couple different approaches, one in T-SQL and one in CLR. Using SET STATISTICS IO ON, this approach reports Table 'TransactionHistory'. Scan count 1, logical reads 484, which confirms the "single pass" over the table. For reference, the original loop-seek query reports Table 'TransactionHistory'. Scan count 113444, logical reads 438366. As reported by SET STATISTICS TIME ON, the CPU time is 514ms. This compares favorably to 2231ms for the original query. While processing each transaction, add to a running total of the costs. Whenever a transaction is a different product than the previous transaction, reset the running total to 0. Return all of the results to the user! Using SET STATISTICS IO ON, this approach reports that no logical I/O has occurred! Wow, a perfect solution! (Actually, it seems that SET STATISTICS IO does not report I/O incurred within CLR. But from the code, it is easy to see that exactly one scan of the table is made and retrieves the data in order by the index Paul suggested. As reported by SET STATISTICS TIME ON, the CPU time is now 187ms. 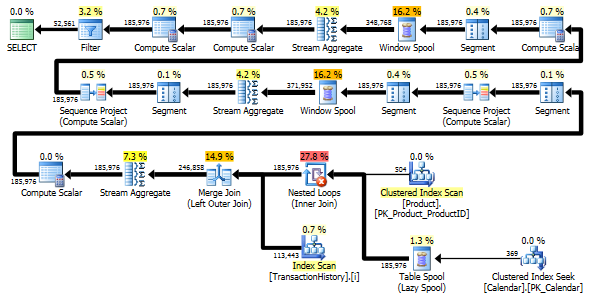 So this is quite an improvement over the T-SQL approach. Unfortunately, the overall elapsed time of both approaches is very similar at about half a second each. However, the CLR based approach does have to output 113K rows to the console (vs. just 52K for the T-SQL approach that groups by product/date), so that's why I've focused on CPU time instead. A disadvantage of this approach, at least in its current form, is that it reads all data in memory. However, the algorithm that has been designed only strictly needs the current window frame in memory at any given time and could be updated to work for data sets that exceed memory. Paul has illustrated this point in his answer by producing an implementation of this algorithm that stores only the sliding window in memory. This comes at the expense of granting higher permissions to CLR assembly, but would definitely be worthwhile in scaling this solution up to arbitrarily large data sets. From the execution plan, we see that the original index proposed by Paul is sufficient to allow us to perform a single ordered scan of Production.TransactionHistory, using a merge join to combine the transaction history with each possible product/date combination. I am using the Production.Product table. This table is freely available on AdventureWorks2012 and the relationship is enforced by a foreign key from Production.TransactionHistory, so I interpreted this as fair game. This approach relies on the fact that transactions do not have a time component on AdventureWorks2012; if they did, generating the full set of product/date combinations would no longer be possible without first taking a pass over the transaction history. There isn't a ton to see here; the main body of the function declares the inputs (which must match the corresponding SQL function), sets up a SQL connection, and opens the SQLReader. The following logic could be written inline, but it's a little easier to read when they are split out into their own methods. -- Now we can actually use the TVF! This CLR approach keeps a copy of the data set in memory. 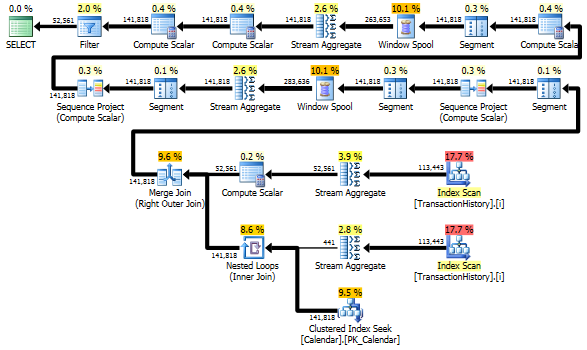 It is possible to use a streaming approach, but I encountered initial difficulties and found that there is an outstanding Connect issue complaining that changes in SQL 2008+ make it more difficult to use this type of approach. It's still possible (as Paul demonstrates), but requires a higher level of permissions by setting the database as TRUSTWORTHY and granting EXTERNAL_ACCESS to the CLR assembly. So there is some hassle and potential security implication, but the payoff is a streaming approach that can better scale to much larger data sets than those on AdventureWorks. CLR may be less accessible to some DBAs, making such a function more of a black box that is not as transparent, not as easily modified, not as easily deployed, and perhaps not as easily debugged. This is a pretty big disadvantage when compared to a T-SQL approach. It yields the full result set requested in the problem statement (as opposed to most other T-SQL solutions, which return a grouped version of the results). This is a long answer, so I decided to add a summary here. At first I present a solution that produces exactly the same result in the same order as in the question. It scans the main table 3 times: to get a list of ProductIDs with the range of dates for each Product, to sum up costs for each day (because there are several transactions with the same dates), to join result with original rows. Next I compare two approaches that simplify the task and avoid one last scan of the main table. Their result is a daily summary, i.e. if several transactions on a Product have the same date they are rolled into single row. My approach from previous step scans the table twice. Approach by Geoff Patterson scans the table once, because he uses external knowledge about the range of dates and list of Products. At last I present a single pass solution that again returns a daily summary, but it doesn't require external knowledge about range of dates or list of ProductIDs. I will use AdventureWorks2014 database and SQL Server Express 2014. Changed type of [Production].[TransactionHistory]. [TransactionDate] from datetime to date. The time component was zero anyway. MSDN article about OVER clause has a link to an excellent blog post about window functions by Itzik Ben-Gan. In that post he explains how OVER works, the difference between ROWS and RANGE options and mentions this very problem of calculating a rolling sum over a date range. He mentions that current version of SQL Server doesn't implement RANGE in full and doesn't implement temporal interval data types. His explanation of the difference between ROWS and RANGE gave me an idea. Indeed, a window of 45 rows would cover exactly 45 days. Unfortunately, our data has gaps in dates. To solve this problem we can use a Calendar table to generate a set of dates without gaps, then LEFT JOIN original data to this set and use the same query with ROWS BETWEEN 45 PRECEDING AND CURRENT ROW. This would produce correct results only if dates do not repeat (within the same ProductID). Unfortunately, our data has both gaps in dates and dates can repeat within the same ProductID. To solve this problem we can GROUP original data by ProductID, TransactionDate to generate a set of dates without duplicates. Then use Calendar table to generate a set of dates without gaps. Then we can use the query with ROWS BETWEEN 45 PRECEDING AND CURRENT ROW to calculate rolling SUM. This would produce correct results. See comments in the query below. I confirmed that this query produces same results as the approach from the question that uses subquery. First query uses subquery, second - this approach. You can see that duration and number of reads is much less in this approach. Majority of estimated cost in this approach is the final ORDER BY, see below. Subquery approach has a simple plan with nested loops and O(n*n) complexity. Plan for this approach scans TransactionHistory several times, but there are no loops. As you can see more than 70% of estimated cost is the Sort for the final ORDER BY. Top result - subquery, bottom - OVER. The last Index Scan, Merge Join and Sort in the plan above is caused by the final INNER JOIN with the original table to make the final result exactly the same as a slow approach with subquery. The number of returned rows is the same as in TransactionHistory table. There are rows in TransactionHistory when several transactions occurred on the same day for the same product. If it is OK to show only daily summary in the result, then this final JOIN can be removed and the query becomes a bit simpler and a bit faster. The last Index Scan, Merge Join and Sort from the previous plan are replaced with Filter, which removes rows added by Calendar. Still, TransactionHistory is scanned twice. One extra scan is needed to get the range of dates for each product. I was interested to see how it compares with another approach, where we use external knowledge about the global range of dates in TransactionHistory, plus extra table Product that has all ProductIDs to avoid that extra scan. 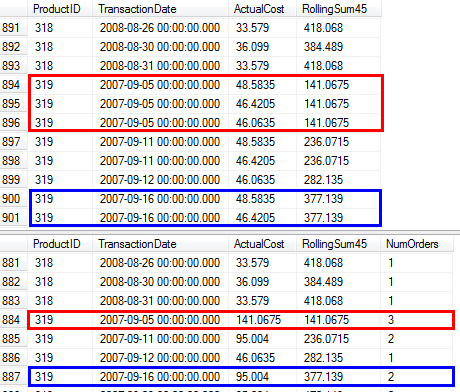 I removed calculation of number of transactions per day from this query to make comparison valid. It can be added in both queries, but I'd like to keep it simple for comparison. I also had to use other dates, because I use 2014 version of the database. Both queries return the same result in the same order. Here are time and IO stats. The two-scan variant is a bit faster and has fewer reads, because one-scan variant has to use Worktable a lot. Besides, one-scan variant generates more rows than needed as you can see in the plans. It generates dates for each ProductID that is in the Product table, even if a ProductID doesn't have any transactions. There are 504 rows in Product table, but only 441 products have transactions in TransactionHistory. Also, it generates the same range of dates for each product, which is more than needed. If TransactionHistory had a longer overall history, with each individual product having relatively short history, the number of extra unneeded rows would be even higher. On the other hand, it is possible to optimize two-scan variant a bit further by creating another, more narrow index on just (ProductID, TransactionDate). This index would be used to calculate Start/End dates for each product (CTE_Products) and it would have less pages than covering index and as a result cause less reads. So, we can choose, either have an extra explicit simple scan, or have an implicit Worktable. BTW, if it is OK to have a result with only daily summaries, then it is better to create an index that doesn't include ReferenceOrderID. It would use less pages => less IO. It becomes a really long answer, but here is one more variant that returns only daily summary again, but it does only one scan of the data and it doesn't require external knowledge about range of dates or list of ProductIDs. It doesn't do intermediate Sorts as well. Overall performance is similar to previous variants, though seems to be a bit worse. The main idea is to use a table of numbers to generate rows that would fill the gaps in dates. For each existing date use LEAD to calculate the size of the gap in days and then use CROSS APPLY to add required number of rows into the result set. At first I tried it with a permanent table of numbers. The plan showed large number of reads in this table, though actual duration was pretty much the same, as when I generated numbers on the fly using CTE. This plan is "longer", because query uses two window functions (LEAD and SUM). Produces exactly the same results, in the same order, as the question. Any duplicate rows (same product and transaction date). This is required because until either the product or date changes, we do not know what the final running sum will be. In the sample data, there is one combination of product and date that has 64 rows. A sliding 45 day range of cost and transaction dates only, for the current product. This is necessary to adjust the simple running sum for rows that leave the 45-day sliding window. This minimal caching should ensure this method scales well; certainly better than trying to hold the entire input set in CLR memory. If you are on 64-bit Enterprise, Developer, or Evaluation edition of SQL Server 2014 you can use In-Memory OLTP. The solution will not be a single scan and and will hardly use any window functions at all but it might add some value to this question and the algorithm used could possibly be used as inspiration to other solutions. First you need to enable In-Memory OLTP on AdventureWorks database. The parameter to the procedure is an In-Memory table variable and that has to be defined as a type. ID is not unique in this table, it is unique for each combination of ProductID and TransactionDate. There are some comments in the procedure that tell you what it does but overall it is calculating the running total in a loop and for each iteration it does a lookup for the running total as it was 45 days ago (or more). The current running total minus the running total as it was 45 days ago is the rolling 45 days sum we are looking for. Invoke the procedure like this. Testing this on my computer Client Statistics reports a Total execution time of about 750 millisecond. For comparisons the sub-query version takes 3.5 seconds. This algorithm could also be used by regular T-SQL. Calculate the running total, using range not rows, and store the result in a temp table. Then you can query that table with a self join to to the running total as it was 45 days ago and calculate the rolling sum. However, the implementation of range compared to rows is quite slow due to the fact that is needs to treat duplicates of the order by clause differently so I did not get all that good performance with this approach. A workaround to that could be to use another window function like last_value() over a calculated running total using rows to simulate a range running total. Another way is to use max() over(). Both had some issues. Finding the appropriate index to use to avoid sorts and avoiding spools with the max() over() version. I gave up optimising those things but if you are interested in the code I have so far please let me know. Well that was fun :) My solution is a bit slower than @GeoffPatterson's but part of that is the fact that I'm tying back to the original table in order to eliminate one of Geoff's assumptions (i.e. one row per product/date pair). I went with the assumption this was a simplified version of a final query and may require additional information out of the original table. Basically I decided that the easiest way to deal with it was to use the option for the ROWS clause. But that required that I only have one row per ProductID, TransactionDate combination and not just that, but I had to have one row per ProductID and possible date. I did that combining the Product, calendar and TransactionHistory tables in a CTE. 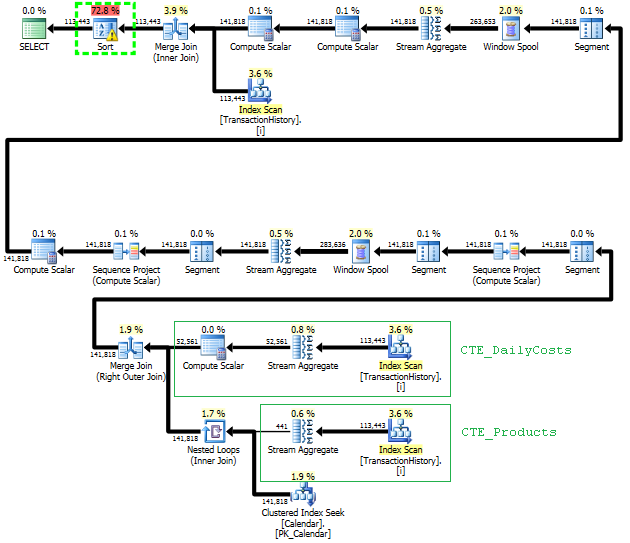 Then I had to create another CTE to generate the rolling information. I had to do this because if I joined it back the the original table directly I got row elimination that threw off my results. After that it was a simple matter of joining my second CTE back to the original table. I did add the TBE column (to be eliminated) to get rid of the blank rows created in the CTEs. Also I used a CROSS APPLY in the initial CTE to generate boundaries for my calendar table. EDIT: In the end I added an index on the calendar table that sped up performance by a reasonable margin. I have a few alternate solutions that don't use indexes or reference tables. Perhaps they could be useful in situations in which you don't have access to any additional tables and cannot create indexes. It does appear to be possible to get correct results when grouping by TransactionDate with just a single pass of the data and just a single window function. However, I could not figure out a way to do it with just one window function when you cannot group by TransactionDate. To provide a frame of reference, on my machine the original solution posted in the question has a CPU time of 2808 ms without the covering index and 1950 ms with the covering index. I am testing with the AdventureWorks2014 database and SQL Server Express 2014. Running sum for a row = running sum of all previous rows - running sum of all previous rows for which the date is outside the date window. One downside of this solution is that there appears to be an unavoidable sort when ordering by the new TransactionDate column. I don't think that this sort can be resolved by adding indexes because we need to combine two copies of the data before doing the ordering. I was able to get rid of a sort at the end of the query by adding in a different column to ORDER BY. If I ordered by FilterFlag I found that SQL Server would optimize out that column from the sort and would perform an explicit sort. Solutions for when we need to return a result set with duplicate TransactionDate values for the same ProductId were much more complicated. I would summarize the problem as simultaneously needing to partition by and order by the same column. The syntax that Paul provided resolves that issue so it's not surprisingly that it's so difficult to express with the current window functions available in SQL Server (if it wasn't difficult to express there would be no need to expand the syntax). If I use the above query without grouping then I get different values for the rolling sum when there are multiple rows with the same ProductId and TransactionDate. One way to resolve this is to do the same running sum calculation as above but also to flag the last row in the partition. This can be done with LEAD (assuming ProductID is never NULL) without an additional sort. For the final running sum value, I use MAX as a window function to apply the value in the last row of the partition to all rows in the partition. I think that there is room for improvement in the above query. There are certainly other ways to use windows functions to get the desired result. Not the answer you're looking for? Browse other questions tagged sql-server sql-server-2012 query-performance t-sql window-functions or ask your own question. How to compute number of concurrent application sessions using SQL Server table storing session data? How can I make this nested query more efficient?